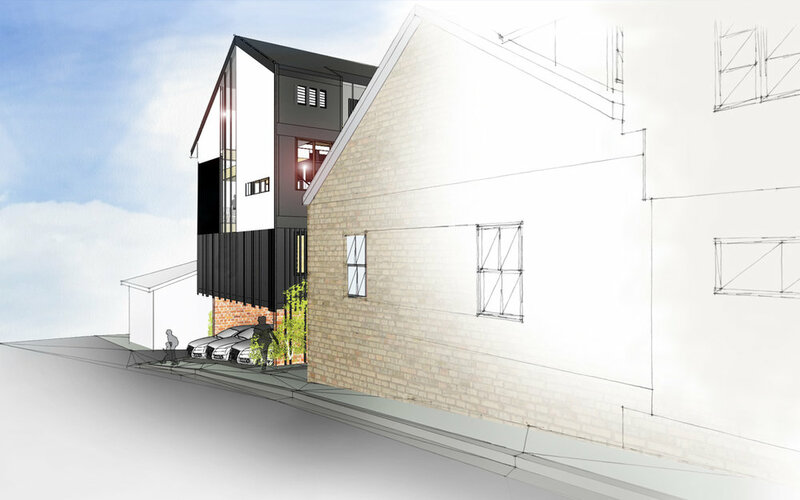 Adjoining a heritage listed building containing three existing terrace houses and a café, three new townhouses to the rear reference the existing building in roof shape, language and materials proposed. The new townhouses also follow the proportion and rhythm of the surrounding houses in this very old character suburb of Brisbane. Each of these contemporary four storey townhouses includes various terraces, decks and balconies and substantial openings to allow for subtropical living. Taking advantage of the lay of the land, the garages are half built into the ground, thus achieving a level back yard for the secondary bedrooms on the first floor. Living rooms on the second floor and master bedroom suite on the top floor can be accessed via lift or an interesting staircase within a sculptural stair well and traveling through internal and external spaces.